Don't Forget! All STV customers are getting a FREE chance of winning £25,000! Simply sign in to the Scottish Children's Lottery [here], pick your numbers for the next draw and submit code 'STVCOMP' - you never know, you could be the next jackpot winner! 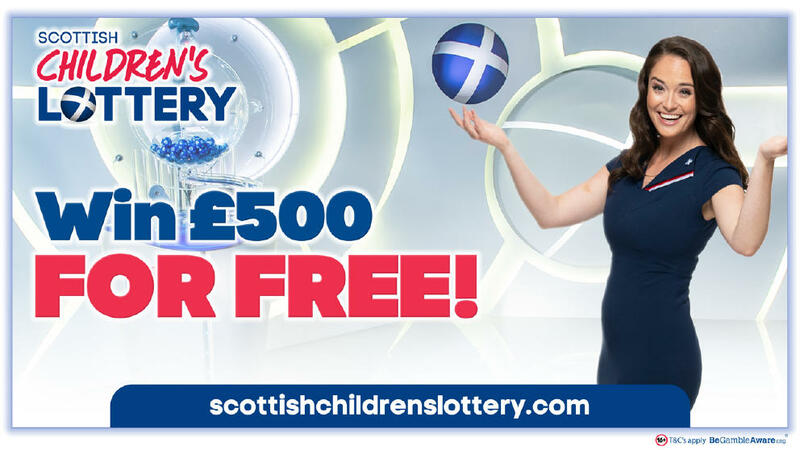 The Scottish Children's Lottery is giving you a chance to win £500! There's no question to answer, just leave your details below...and that's it! The prize draw closes at 6.00pm on Sunday 30th June, so enter now! What's more is all STV customers are getting a FREE chance of winning £25,000! Simply sign in to the Scottish Children's Lottery [here], pick your numbers for the next draw and submit code 'STVCOMP' - you never know, you could be the next jackpot winner! I am happy to be contacted by email with marketing information from Scottish Children's Lottery. Sorry, something went wrong on our side when you tried to enter. Please try entering this competition again. If you continue to have problems please contact STV. You have reached the maximum number of times you can enter this competition. For more great chances to win, head over to stv.tv/win. Please answer all questions. Sorry you must be 18 or over to enter this competition. Sorry, this competition is open for Scottish residents only. Sorry, this competition expired on Sunday, 30th June at 18:00. 1 x winner will receive £500.